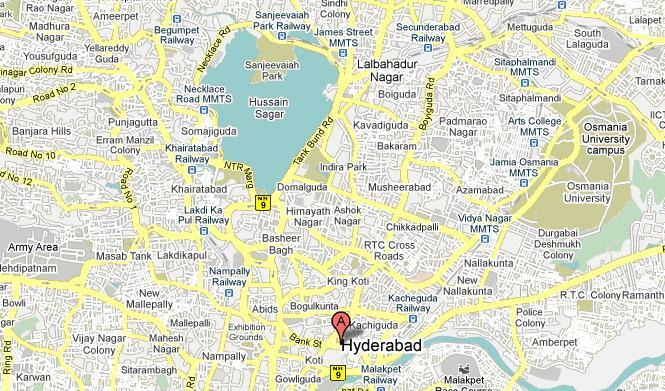 As you can see in this Central Hyderabad map, Hussain Sagar stands as the major attraction of this place. In the modern Hyderabad, this part of the city is vital among all others, with being hub of the administrative, tourism as well as commercial centers of the entire state. This place holds major administrative offices of not only the state government but also many small and big private firms and businesses. It also has historic as well as spiritual importance, along with touches of modernization. Of course, it holds one of the major and historical universities of India and some good educational institutes of Hyderabad, proving itself in educational aspects. If one wants to appreciate or understand cosmopolitan Hyderabad, then they should visit the Central Hyderabad in the map here. This map holds many historical memories of the Hyderabad state, each as significant and as contributing on its own. Firstly we will start with the Hussain Sagar, which is an artificial lake built in credit of Hazrat Hussain Shah Wali, in 1562, during Qutubshahi reign. The lake was a tributary to the Musi river and took care of the water and irrigation necessities of the Hyderabad city. On a side note, today it is even hard to imagine somebody using this water as a resource for daily necessities. However, the water was not as bad even during the Nizamian era as one can see the Bella Vista, the royal palace of Nizam built in 1910, to enjoy the beautiful sight of Hussain sagar. In mid of Hussain sagar, stands a huge idol of Gautama Buddha, erected in 1992. The Koti Residency, a fort built in 1798 was once the embassy of the representative of the British. It was in 1949, when it got converted into Koti Women’s College. Almost all the other major constructions here are built during the reign of the last Nizam, when the development of Hyderabad was at its peak. The Hyderabad town hall, built in 1913, serves as the Legislative Assembly Hall of the state today. The state administration is run from the Secretariat located just to the south of Hussain Sagar. The Osmania University, established in 1918, is one of the largest university systems in India even today. The Osmania General Hospital established in 1910, with a bed capacity of 1168, is still one of the biggest in the state. The King Koti, marked in this map is where the King Kothi palace is located, in which the last Nizam lived. The Hussain Sagar is surrounded with many parks, lawns, restaurants and recreational facilities; adding to which is the view of the lake itself. The Lumbini park, Sanjeeviah park and the NTR gardens are the main ones close to the lake. Of course there is Public gardens in a little distance holding many major constructions of Nizam like the Jubilee Hall, Archeology Museum, Indira Priyadarshini Auditorium, Potti Sriramulu Telugu University, Lalita Kala Thoranam, Jawahar Bal Bhavan besides the Assembly building. The Birla Mandir here is one of the temples built by Birla Foundation in India, entirely built in white marble. One will definitely not miss the huge idol of Ganesh at the Khairtabad state library and the processions around Hussain Sagar, during the festival. You can find Prasads IMAX with biggest IMAX 3D screen in the world here. The Osmania University is the major educational institute here with many wings for arts, science, business, commerce, engineering, etc. For medical sciences, there is Osmania Medical College. For regular graduation, there are Nizam, AV and Shadan colleges. There are many oldest and best missionary schools of the city built by British as well as French missionaries like All Saints High School, Stanley Girls High School, Rosary Convent High School, etc. Though corporates malls and outlets like Hyderabad Central (in Punjagutta), Big Bazaar do exist, there are even traditional markets like Mojamzahi market. The central part of Hyderabad city has many hotels ranging from 5-star hotels to Irani cafes. The top rung ones being ITC The Kakatiya and The Taj Krishna, there are places like Gokul chat for evening snacks. This entry was posted on Mar 2010 at 12:45 PM	and is filed under Hyderabad Maps. You can follow any responses to this entry through the RSS 2.0 feed. Your Feedback Matters!